Six more to go! This was the feeling that Liverpool exerted as it felt they were able to score another six goals to match the goal difference of Manchester City, but this would turn to be their downfall. The goal spree started with Joe Allen in the 18th minute, nodding home a corner. Daniel Sturridge doubled the advantage after the break, with a deflected effort that bounced past Julian Speroni. Two minutes later the score was made 0-3 to the visitors by the one, the only, Luis Suarez. Sterling played in a delicate ball that Suarez put away with ease, but instead of celebrating like the job was done, the prolific Uruguayan picked the ball out of the net as if they had just equalized. The mentality was to score more to match Manchester CIty's superior goal difference, but Liverpool's straight forward thinking cost them. In the 65th minute, a substituion was made, Jason Puncheon was off, Dwight Gayle was on, this a moment that has influenced the title race . In the 79th minute, it seemed the Red side of Merseyside's defence switched off. Glen Johnson, outstanding all game, stood watching Damien Delaney who rocketed the ball into his side and deflected past Mignolet. Then 81st minute, after Liverpool had a penalty shout denied, Palace attacked, the Eagles swooping in formation. Yannick Bolasie flew past Johnson, then squared a ball to the substitute Dwight Gayle who turned it into the back of the net. With two minutes of normal time remaining, Liverpool looked nothing like a side only 1 more game from a possible first title in 24 years. This was a team that had been winning 0-3, now the score was 2-3, and their nerves were jangled. Then in a moment that must have been slowed time down to a halt, Glen Murray headed a ball into the path of Dwight Gayle, one on one with Mignolet. What followed was the moment that Manchester City fans all around the world would have loved to see, one they probably celebrated just as hard as a goal of their own, Gayle had made it 3-3. The match still wasn't over. Palace looked like they could score another, but Liverpool were now desperate. The last cliffhanger of the match came when a corner from Steven Gerrard flew over everyone and came to Coutinho outside the box. he whipped a ball into the box, and Speroni palmed it away, but only for it to fall to Victor Moses with an open goal. The Nigerian took an air swing, and now time was frozen for City and Palace fans alike. The ball was swarmed by players, and it was inevitable the ball would end up in the net, but no Liverpool player could make a good contact. Lucas swung a shot but got deflected to Moses at the right of the goal then crossed it to Suarez, which went out off him. Liverpool's night title hope had just taken a massive hammer blow. 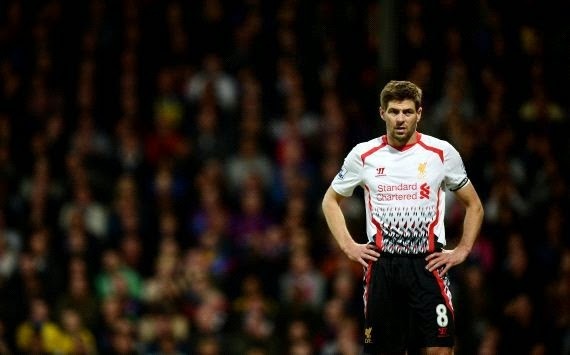 Liverpool had just thrown away a 3-0 lead, and the images that followed were not pretty. 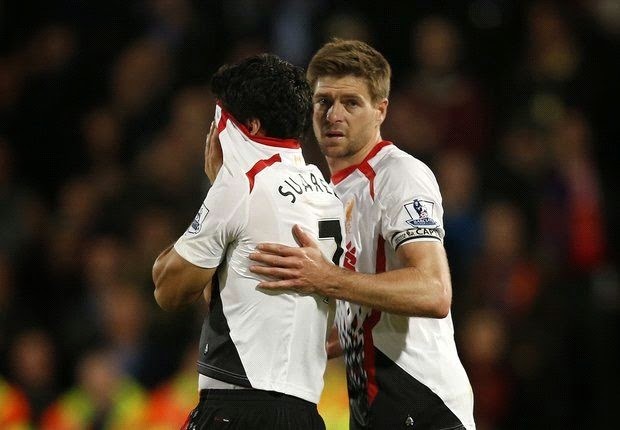 Suarez had put his shirt over his head, most likely hiding tears, and was consoled by team mates. Captain Steven Gerrard comforted him, and ushered the camera away from the top scorer in the premier league, but the faces of the other Liverpool players gave a hint of what Suarez's face was like under that white jersey.